1982's Basket Case put New York auteur Frank Henenlotter on the cult-movie map, as this twisted, sleazy monster romp through a pre-Disney Time Square made him an instant hit with the gore crowd. However, it would be six years before Henenlotter delivered another film, but 1988's Brain Damage was certainly worth the wait, as it's a drug allegory like none other. He followed this with 1990's Frankenhooker, which represented a departure for Henenlotter. While it certainly had a grotesque story, it focused more on humor and cartoonish make-up effects. This focus continued with Basket Case 2, a movie which somehow had the same characters as Basket Case, but a completely different tone. Where would Henenlotter go with Basket Case 3: The Progeny? Basket Case 3: The Progeny opens not long after the event of Basket Case 2. Feeling that her house of “freaks” is in danger of being revealed and concerned about Eve’s (Denise Coop) pregnancy, Granny Ruth (Annie Ross) packs up everyone into a school bus and drives them to Georgia. There, they seek refuge with Ruth’s old friend, Hal (Dan Biggers), who also has experience working with freaks. Hal’s son, Little Hal (Jim O’Doherty), is also special and has a talent for building things. On the way into town, Duane (Kevin Van Hentenryck), who has been placed in a strait-jacket by Ruth, meets Opal (Tina Louise Hilbert), the sheriff’s (Gil Roper) daughter. Once at Hal’s, Eve, who was impregnated by Duane’s deformed brother, goes into labor and delivers a dozen little Belial’s. Meanwhile, Duane is able to escape and seeks help from Opal. However, this move will expose the freaks and begin a war with the locals. At first glance, Basket Case 2 and Basket Case 3 look as if they may be a set of sequels which were shot back-to-back. But, in reality, they were shot about two years apart. When you watch the two movies in one sitting, the differences really jump out. As stated in my review for Basket Case 2, that movie has an overall cheap look, especially with the sets. Also, the visuals were a bit drab. Basket Case 3 has a much slicker look. Perhaps this has to do with the fact that the production got out of New York City and moved to Georgia (and this was years before everything was shot in Georgia). This means that we get actual exterior locations and practical interior locales. (If the house used here was a set, it’s light years past Basket Case 2.) As we’ll discuss in a moment, the image is an improvement as well. As for the film itself, this third film is almost a carbon copy of the second movie. Once again, we have Granny Ruth and her family of “freaks” hiding out in a large house, and again, they are threatened by an outside force -- In 2, it was the press, here it is the police. Again, we have Duane finding himself torn between his loyalty to his brother Belial and a woman. Again, we have Belial killing people. The movie also continues the bizarre humor which surfaced in the last film, especially in the truly oddball birthing scene, which juxtaposes a truly gross sequence with...I’m not kidding...a stand-up routine from Little Hal. Other than the baby Belials, the only truly new thing introduced in Basket Case 3 is something which shows up in the finale, which I actually won’t reveal, but it’s something that doesn’t really fit with the series, but is actually kind of cool. 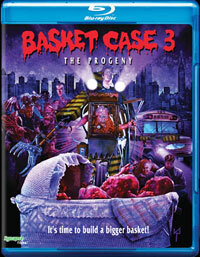 Basket Case 3: The Progeny busts out a Guinness World Record level bassinette on Blu-ray Disc courtesy of Synapse Films. The film has been letterboxed at 1.78:1 and the Disc contains an AVC 1080p HD transfer which runs at an average of 31 Mbps. The image is sharp and clear, showing only trace amounts of grain and no overt defects from the source materials. The colors look excellent here, most notably the pastels. The picture is never overly dark or bright. This should serve as an example of how a low-budget movie shot on film 25 years ago can look pretty good. The picture is a bit flat at times and there are a few moments where it goes soft. The Disc carries a DTS-HD Master Audio 2.0 track which runs at 48 kHz and an average of 1.6 Mbps. The track provides clear dialogue and sound effects. This is a satisfactory track which allows us to always hear those who are speaking and enjoy Belial's growls. The music doesn't drown out the dialogue and there is no hissing. The lone extra on the Basket Case 3: The Progeny Blu-ray Disc is a THEATRICAL TRAILER for the film.